Gregg Drilling Safely Injects ERD-CH4™ Liquid Antimethanogenic ISCR Technology > Provectus Environmental Products, Inc.
By Robert Meyer – Project Manager at Gregg Drilling & Testing Inc.
Last week we completed another successful In-Situ Enhanced Reductive Dechlorination project in the South Bay Area for an Environmental Engineering firm. 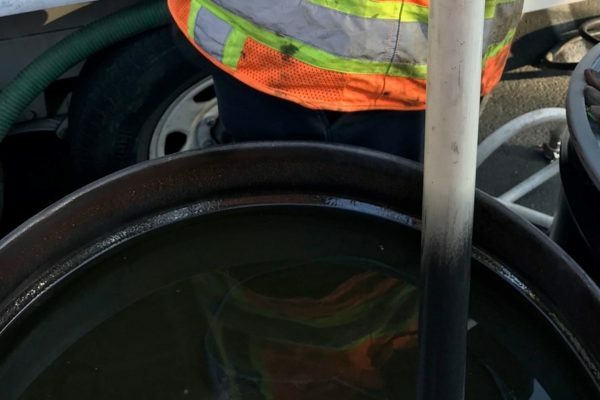 Our team was able to overcome a series of logistical hurdles including water pre-treatment in a transitional storage/treatment tank, small footprint to work in, relatively deep application depth, and a building under active tenant improvement work. As usual, we are used to working in tight spaces. We organized the site prior to equipment arrival in order to ensure safe operation of all equipment. 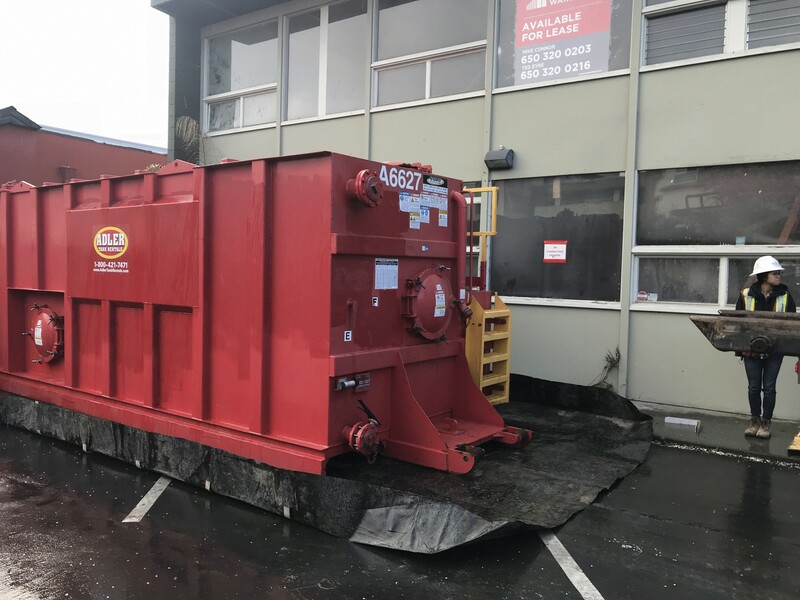 Our storage tank was provided by Adler, whose driver was able to place the tank within 4 inches of the curb on 2 sides. 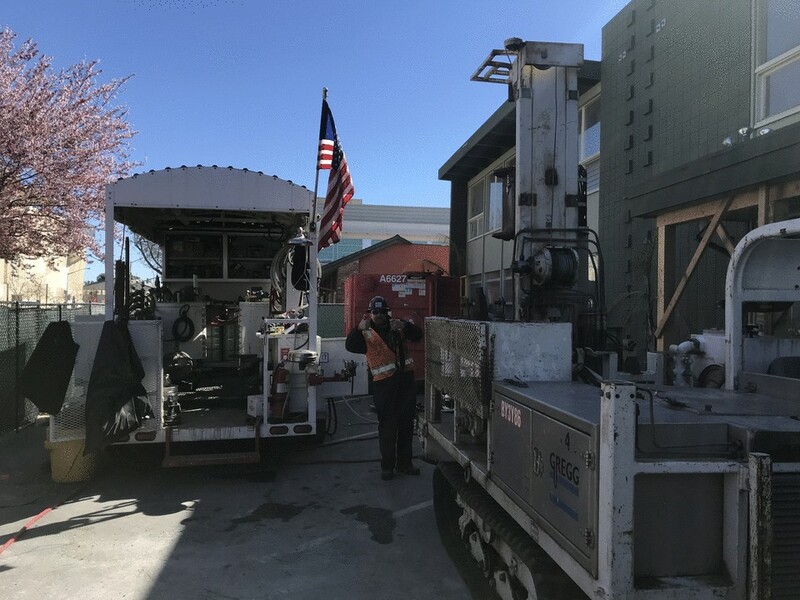 This allowed us to maximize the parking lot space for our mixing trailer to gain access to all exterior injection boring locations. 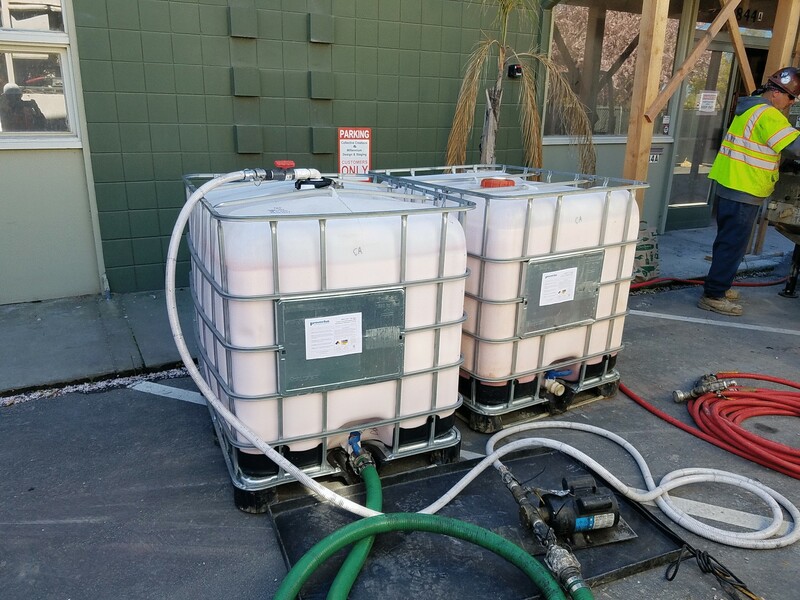 The Emulsified Vegetable Oil was provided by Provectus Environmental Products with an antimethanogenic agent pre-mixed which allowed our crew to focus on dilution and injection of the reagent material. In order to ensure a uniform mixture, each tote was recirculated for 20 minutes prior to use. 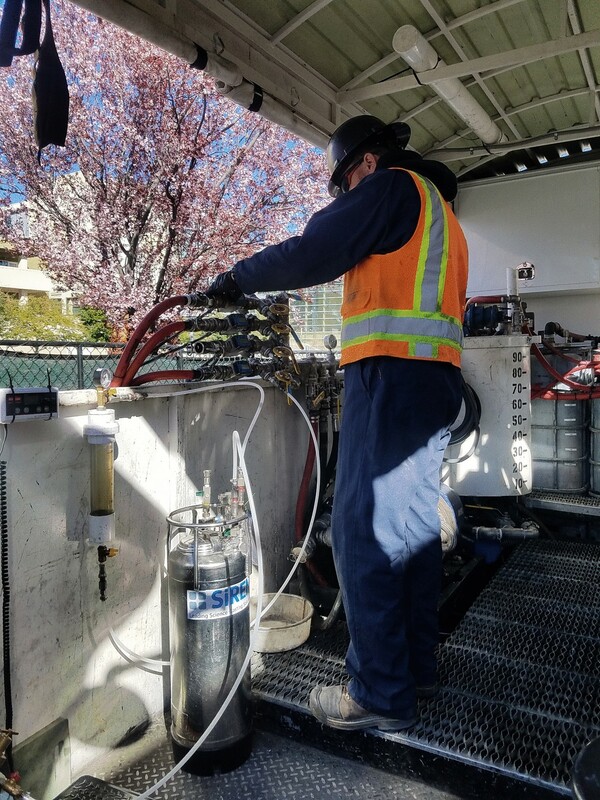 Dehalococcoides (DHC) bacteria were provided by SiRem; our crew has worked with this material many times, and the trailer is set-up very well to allow for quick field implementation of the SiRem equipment. While working inside the building, our team had to work with the general contractor and subcontractors who had multiple scissor lifts, welding equipment, air systems and electrical transmission equipment in support of their work. We were able to work with them, but also worked one Saturday when the construction crew was not working. 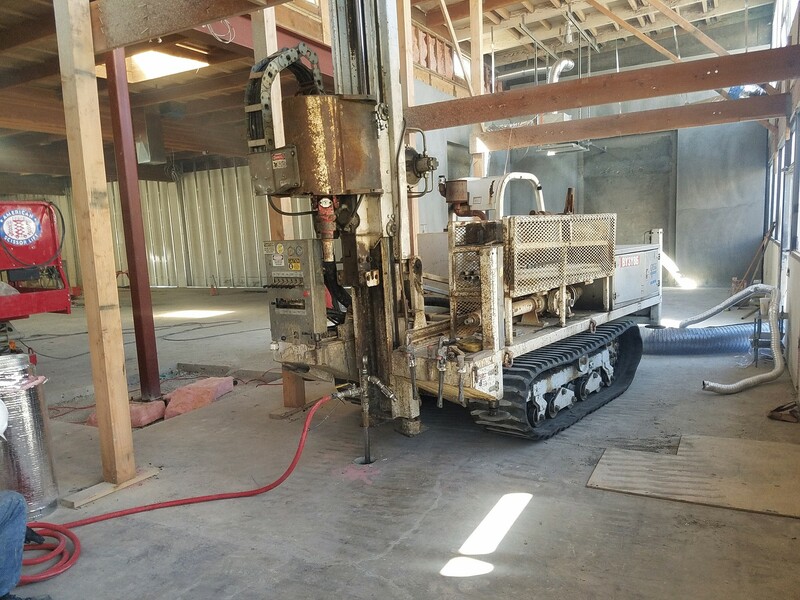 Our injection intervals were as deep as 75′ which was no problem for our “Rhino” rig to achieve, and we had plenty of direct push tooling to maintain 3 to 4 injection points simultaneously. Brandon was able to accurately track total volume injected into each point using our flowmeters/totalizers which were calibrated to the injectate prior to injection. Our calibrations were verified using graduated markings.